Super DREADNOUGHT-Class Battleship ordered under the 1911 Programme and built by HM Dockyard, Portsmouth. 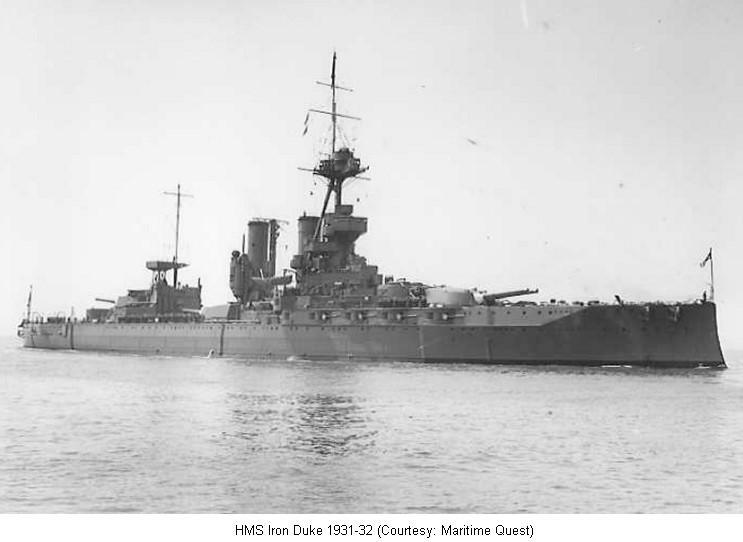 The ship was laid down on 15th January 1912 and and launched by the wife of the 4th Duke of Wellington on 12th October 1912 as the 2nd RN ship to carry the name, previously used for an ironclad in 1870. Build was completed on 9th March 1914. She was deployed in the Grand Fleet during WWI and was Flagship of Admiral Sir John Jellicoe. After the armistice she took part in Black Sea operations to support the White Russians. She remained on the Active List until 10th December 1931 when Paid-of and de-militarised. B and Y turrets, the torpedo tubes and some of the armour plating were removed. The ship was then deployed at Portsmouth as Gunnery Firing Ship and after 1936 used as Boys Training ship. In August 1939 she attended the Review of the Reserve Fleet and took up her war station on 26th August for use as a Depot Ship at Scapa Flow. She was one of the last British battleships to be coal fired..
August Attended Review of Reserve Fleet in Weymouth Bay. Passage to take up War Station at Scapa Flow. personnel in transit to and from ships of the Home Fleet. October Scapa Flow deployment in continuation. 16th During attack by Ju88 aircraft on Scapa Flow sustained some damage from near misses. Ship developed significant list had to be beached at Ore Bay..
November Remained at Scapa Flow as Base Ship with reduced complement. January Scapa Flow deployment in continuation. 26th Re-beached in position where ship remained aground at all states of tide. 16th Sustained slight damage during air attack. April Scapa Flow deployment in continuation. Scapa Flow deployment in continuation. January Depot ship deployment in continuation at Scapa Flow. Nominated for transfer to Clyde and Laid-up.